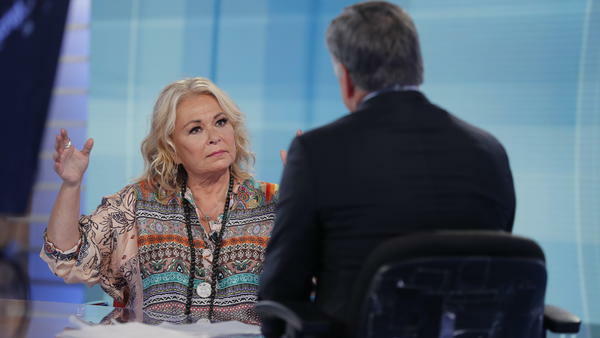 Roseanne Barr talks with Fox News talk show host Sean Hannity while being interviewed during a taping of his show Thursday in New York. It was the first time she appeared on TV since she was fired from ABC. The network canceled its successful reboot of Roseanne in May following the star's racist tweet involving former Obama adviser Valerie Jarrett. Roseanne Barr has just given a master class on how not to apologize for a massive public flameout. Appearing on Fox News pundit Sean Hannity's show Thursday, Barr claimed the backlash over a widely condemned racist tweet that led to ABC canceling her show was a huge misunderstanding. The tweet implied that senior Obama adviser Valerie Jarrett was the offspring of the Muslim Brotherhood and an ape. Barr's defense? She didn't know Jarrett — who was born in Iran to American parents — was an African-American woman. "You could have knocked me over with a feather when they said she was African-American," Barr told Hannity of the moment when executives from ABC asked her to explain the posting. "I thought she was Middle Eastern." Which implies she did think it was OK to compare a person from a country in the Middle East to the offspring of an ape — another serious stereotype. There was no discussion of the other time she called a black Obama official an ape: a 2013 tweet where she said former national security adviser Susan Rice was a man with the genitalia of an ape. Barr insisted the Jarrett tweet was "political," not "racial," and was connected to Barr's advocacy for Israel. But her clumsy explanations didn't really address why she used such loaded language in the first place. The comic also claimed a recent video she released on YouTube, saying of Jarrett, "I thought the b**** was white," was a joke. "I made a mistake," Barr said of the original tweet, after a bit of prodding from Hannity. "And I lost everything." Hannity devoted his entire, hourlong show Thursday to his talk with Barr. It was hyped as the superstar comic's first TV interview after ABC dropped one of the highest-rated shows of the last TV season within hours of her posting back in May. But, despite having an hour to make her case, Barr rarely stuck with one topic for long, hopscotching through various topics and defenses. In one part of the interview, the comic insisted she didn't want to hurt anyone or cause anyone pain. In another moment, she made fun of Jarrett's haircut after delivering a rambling non-apology that mostly seemed to blame Jarrett for being offended by the tweet in the first place. "I'm so sorry that you thought I was racist and that you thought my tweet was racist, because it wasn't," Barr said, after Hannity asked what she might say to Jarrett if they spoke on the phone or if she was watching his show. Barr looked into the camera and said, "I'm sorry that you feel harmed and hurt. I never meant that and for that I apologize." Jarrett appeared on the daytime talk show The View on Wednesday and said she wasn't planning on watching Barr's interview. There was one question Barr wouldn't answer: whether she was paid by ABC when she agreed to step away from her sitcom revival after the cancellation, allowing the show's remaining cast members and crew to develop a show without her called The Conners, debuting this fall. Barr said she has struggled with mental health issues, adding she had multiple personalities that were integrated a dozen years ago through therapy. "We could turn this into a really great, teachable moment," Barr told Hannity. But, in watching a once-great sitcom star fail to really explain the racist outburst that ruined her career, viewers have seen all they need to know.